A revolutionary reappraisal of how to educate our children and young people by Ken Robinson, the New York Times bestselling author of The Element and Finding Your Element Ken Robinson is one of the world’s most influential voices in education, and his 2006 TED Talk on the subject is the most viewed in the organization’s history. Now, the internationally recognized leader on creativity and human potential focuses on one of the most critical issues of our time: how to transform the nation’s troubled educational system. At a time when standardized testing businesses are raking in huge profits, when many schools are struggling, and students and educators everywhere are suffering under the strain, Robinson points the way forward. He argues for an end to our outmoded industrial educational system and proposes a highly personalized, organic approach that draws on today’s unprecedented technological and professional resources to engage all students, develop their love of learning, and enable them to face the real challenges of the twenty-first century. 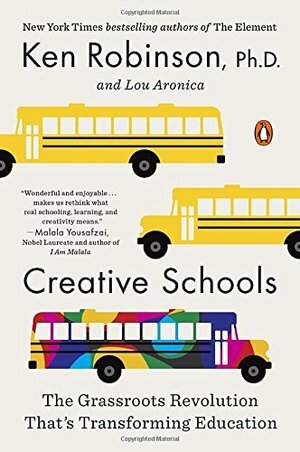 Filled with anecdotes, observations and recommendations from professionals on the front line of transformative education, case histories, and groundbreaking research—and written with Robinson’s trademark wit and engaging style—Creative Schools will inspire teachers, parents, and policy makers alike to rethink the real nature and purpose of education.From the Hardcover edition.